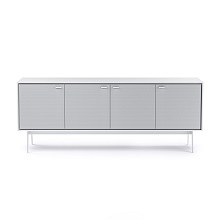 The Tanami credenza by BDI is a visually stunning, artistic storage credenza with sculpted grey fog doors and attractive metal legs. The Tanami contrasts parallel lines with flowing patterns of movement. The credenza can serve as functional art to store belongings in your entryway, hallway, and living or dining room, as well as double as a media cabinet. 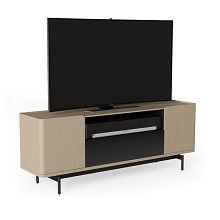 Its beautiful doors discretely conceal four compartments with adjustable shelves, and it has cutouts in the back of the cabinet to help organize wires or cables for media use. With its unique, functional design, the Tanami will be an object of admiration and conversation in your home.